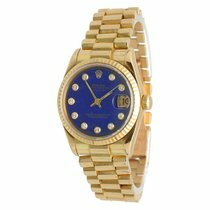 The Rolex Datejust has been enthralling watch lovers for decades with its simple elegance. A the cyclops lens over the date display makes it easy to read. The Datejust also features the beautiful five-piece link Jubilee bracelet, exclusive to this model. Rolex celebrated their 40th anniversary in 1945. Fitting to this occasion, they premiered the Datejust. At the time, it was the first water-resistant chronometer with an automatic movement and date display. Just like their predecessors, the date display is still located at three o'clock on today's models. The display springs forward a day exactly at midnight. 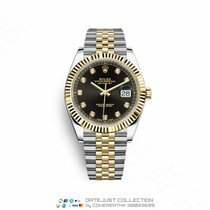 The most famous owner of a Rolex Datejust was US President Dwight D. Eisenhower, who received his timepiece from the Genevan manufacturer as a gift. In 1945, Rolex also introduced their Jubilee bracelet to be paired exclusively with this timepiece. Today, the five-piece link bracelet is made of either stainless steel or white, yellow, or rose gold and comes in bicolor combinations. Rolex has their own foundry where they independently produce the gold for their watches. Since 1945, numerous models have been made available with the three-piece link Oyster bracelet or a leather strap. The Datejust is available in various sizes - from 28 mm to 41 mm - which makes it perfect for almost any wrist size. Since 1957, Rolex has offered smaller sizes meant for women under the name Lady-Datejust. The Datejust line has a larger variety of options than most other Rolex watches. How much is a Rolex Datejust? You can buy a 41-mm stainless steel Rolex Datejust in mint condition for around 7,300 USD. Pre-owned models cost a few hundred USD less. Bicolor models in gold and stainless steel have a retro touch and cost 11,200 USD when new. 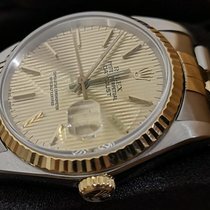 You can find pre-owned pieces for less than 11,100 USD. While the bicolor stainless steel and yellow gold versions could be straight from the 1980s, the editions in stainless steel and Everose gold have a more feminine touch. The most classic Datejust is 36 mm "small" and is made of 18-karat yellow gold. Though this was a common men's watch size in the 20th century, today it is viewed as more of a unisex size. You can get a mint-condition 18-karat gold Datejust 36 in yellow gold for about 26,200 USD. Pre-owned examples go for around 20,100 USD. Prices for pre-owned first generation models vary greatly, ranging from 11,100 to 25,900 USD. Watches in good condition with the reference number 4467 cost an average of 18,400 USD. The delicate 28-mm Lady Datejust also comes in gold, stainless steel, and bicolor versions. A highlight of this women's watch collection is the platinum edition with a diamond-studded bezel, diamond indices, and a shimmering mother-of-pearl dial. If you're interested in a platinum Lady-Datejust with the reference number 279166, be sure to set aside around 38,100 USD. The stainless steel Lady-Datejust is much less expensive at 6,400 USD for a never-worn piece. If you're on the lookout for a watch for almost any occasion, the timepiece with a date display should be your first choice. With the Datejust, Rolex has created an ideal everyday watch that can be worn with both business suits and casual attire. There's a case size for almost every wrist: from the 28-mm Lady-Datejust to the 41-mm men's Datejust. Classic design elements like Roman numerals or fluted bezels lend some models a more conservative look. White, yellow, and Everose gold make this collection highly valuable. Numerous bicolor models in stainless steel and solid gold are also available. Particularly elegant models include diamonds on their bezels and dials. The five-piece Jubilee bracelet is exclusive to this series. The first Datejust with reference number 4467 was available solely in yellow gold with a matching Jubilee bracelet. It did not yet feature the characteristic magnified date display; the Cyclops lens, which magnifies the display by 2.5x, was first added in the mid-1950s. Its name references its resemblance to the one-eyed creature from Greek mythology. 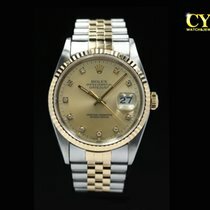 The dial of the first Datejust was cream colored and had gold indices. The date window was, and still is, at three o'clock. Red and black numbers represented even and odd days, respectively. Below the index at 12 o'clock was the inscription "Rolex Oyster Perpetual", and "Officially Certified Chronometer" was above six o'clock. The "Datejust" inscription first began appearing sporadically on the dials of reference numbers 5030 and 5031. With reference numbers 6074 and 6075, it became an established feature of the dial. The Rolex designers decided on a golden, fluted bezel. Former US President Dwight D. Eisenhower had an 18-karat gold Datejust. His watch, with reference number 6305, was clearly visible when he was featured on the cover of Life Magazine on July 21st, 1952. Eisenhower was the first US president to wear a Rolex watch. He received it as a gift from Rolex on the occasion of their 150,000th chronometer, in honor of his efforts in World War II. Similarly, to celebrate the company’s 100,000th watch, they gifted British Prime Minister Winston Churchill a Rolex chronometer. Konrad Adenauer, the first chancellor of West Germany, also received a Datejust from Hans Wilsdorf himself. Eisenhower's model was specially customized: His initials (DDE), the date (12-19-1950), as well as five stars, were all engraved on the case. The stars symbolized his five-star general rank in the US army. His initials were also on the bracelet's clasp. The Day-Date was the watch of choice for many presidents. Rolex introduced the model with a date and day display at 12 o'clock in 1956. The watches are available exclusively in 18-karat gold or platinum. World and religious leaders – such as Lyndon B. Johnson, Fidel Castro, and Pope John Paul II – are some of the most well-known wearers of this watch. Like the Datejust, the Day-Date has its own bracelet: the semi-circular three-piece link President bracelet , available in gold or platinum. Unlike the Submariner, which is only available in stainless steel without a date display, the Datejust comes in a variety of unique designs. For a more traditional look, there is a stainless steel model with a three-piece link Oyster bracelet, polished bezel, and silver dial. More colorful models feature bicolor combinations of stainless steel and yellow, white, or rose gold. Women's models feature diamond-set bezels and mother-of-pearl dials. The latter is made of 18-karat Everose gold, has a case diameter of 36 mm, and features a leather strap. The gem hour markers each have their own gold frame and are set by hand on the dial. Somewhat simpler, yet still elegant, are the bicolor stainless steel and 18-karat white gold versions. Rolex has been referring to these bicolor stainless steel and gold combinations as “ Rolesor” since the mid-1930s. Black dials on some of the watches create a stark contrast with the silver, fully polished case and polished and brushed Jubilee bracelet. The Oyster bracelet is similar; its center links are polished while the outer links are brushed, creating a harmonious contrast. You can read the watch in the dark as well, as both the hands and indices are luminous. The fluted bezel harkens back to the first Datejust from 1945. There is a wide range of dial options available: bronze, chocolate, pink, green, or silver floral motif dials, as well as plain dials in chocolate, black, white, silver, rhodium, blue, pink, or champagne. The bezel colors are likewise diverse: The options range from yellow gold to rose gold to silver. Rolex expanded the Datejust line in 2009 with a 41-mm version, the Datejust II. This size appeals to fans of larger watches and can be identified by the extra “II” at the end of its name. Like the 36-mm Datejust, the Datejust II is available in many different versions. It's comparable to the Globemaster from Omega, which is COSC-certified, 39 mm in diameter, and features a date display at six o'clock as well as a fluted bezel. The Omega watch is available in stainless steel, yellow gold, rose gold, or a bicolor version. Datejust models are exclusively powered by automatic, in-house calibers from Rolex with a date display, as was the very first model with reference number 4467. Today Rolex uses caliber 3135 in the 36-mm versions and 3235 in the 41-mm versions. The 3235 caliber has an improved 70-hour power reserve and features Rolex's Paraflex shock protection system, while the 3135 does not. The system can absorb shocks and jolts 50% better than the usual protection systems. Older models with the caliber 3136 also include the Paraflex shock system. The blue Parachrom hairspring made from a patented zirconium-niobium alloy adds to this movement's robustness and precision. It is a part of both calibers and remains unaffected by magnetic fields and temperature fluctuations. Furthermore, it has a so-called "Breguet balance spring," or an upraised last coil, which reduces its curvature and allows the spring to breathe better. This also increases the accuracy. Fine regulation occurs via the typical Rolex Microstella nuts. Using a special tool, you can regulate the watch without disassembling it. Like every Rolex watch, the Datejust is COSC-certified. The Datejust is a perfect watch for almost any occasion. Thanks to its screw-down case back and Twinlock crown system, it's water resistant to 10 bar (100 m, 328 ft). Therefore, you can wear this watch not only while playing golf or tennis but also while swimming. Scratch-resistant sapphire glass protects the dial and adds value. In-house movements from Rolex have been regarded as some of the best out there by watchmakers for years. The company's perfected caliber technology makes these watches incredibly precise and reliable. Furthermore, watches from this Swiss brand embody power, prestige, and influence. The most powerful people in the world know this; that's why they choose Rolex.